There are sharply divided views about the academic value and role of chapters in books across disciplines, and within some of them between defenders and critics of the form. 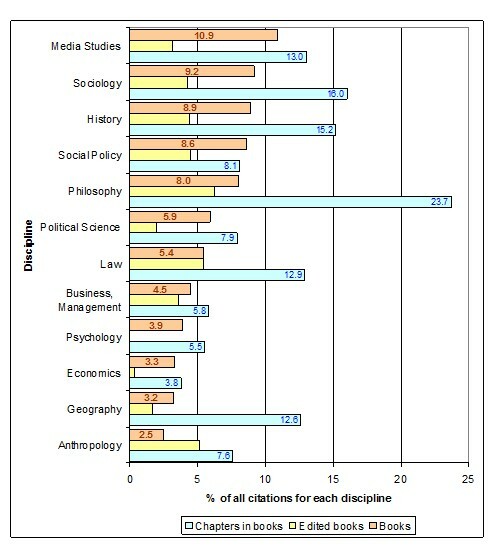 In some humanities and social science disciplines chapters account for large shares of outputs and are still well regarded. Here ‘a book chapter.. is an independent article with roughly the same status as a journal article. The review and revision process involved is very similar to that for journal articles’ says the historians’ guide by Iacovetta and Ladd-Taylor. My chart below is taken from Bastow et al, The Impacts of the Social Sciences, and records cites from multiple different sources for a sample of British academics in 2010-13. Chapters in books accounted for more than one in eight cites in five disciplines (sociology, media studies, history, geography and law), and nearly a quarter of citations in philosophy. Note that the patterns of chapter citing are not closely correlated with those for book and edited book citing. (Sadly this study did not cover wider humanities fields, where chapters play a big role also in English, literature studies, theology and other areas). In pre-digital times up until the late 1980s, chapters were well used and well respected as a form of publication in the social sciences and humanities. This was a period when academic books mostly had to be physically handled by customers (in bookshops, at conferences or via inspection copies) in order to achieve sales. However, in the early decade and a half of the digital era, chapters in edited books became less and less easy to learn about or find. The proprietary bibliometrics systems created in the 1980s, like the Web of Knowledge and Scopus, covered only journal articles until around 2010. They ignored all forms of books and book chapters, because they were seen as unimportant for research in their heartland STEM disciplines. And although Web space costs nothing, publishers publicized edited books only with digital facsimiles of their print catalogue entries. So even publisher web pages for edited books typically did not fully list all chapter authors and their titles — a legacy practice that continues completely unchanged to this day. Chapters literally became invisible and unfindable. At the end of this stage, in 2012, the eminent psychologist Dorothy Bishop looked systematically across her own outputs and concluded that on average (and controlling for time since publication) the citations for her chapters in books were a third of those for her journal articles. They were also cited less than review articles (those not reporting primary research findings), with which chapters are perhaps more comparable. (i) ‘It needs to be well-written and interesting’, both factors that the author can fully control. (ii) ‘It needs to be tagged so that it will be found on a computer search’. Many authors remain pretty ignorant of just how little publicity any publisher will give to individual chapters or their authors. Some specially salient edited books may get their own leaflets, giving complete authors plus chapter lists. These can be available a conferences, circulated in print form via libraries and professional associations, and publicized through mailing lists and email alerts. But even now (when digital space is costless) publishers’ catalogues rarely give complete titles and author or chapters lists for the bulk of edited books. So potential readers generally had no way of knowing in detail what particular chapters cover or argue, even by accessing publishers’ websites. Almost their only chance of learning more was if a free chapter is available, or if they can physically handle the book in a bookshop or at a conference. (iii) ‘It needs to be accessible and not locked behind a paywall’. Journals are increasingly restricted on their ‘embargo periods’, the length of time that they can bar authors from re-posting manuscript versions of their paper on sites beyond their home university repository (where they can be lodged immediately). And Bjorn Brems recently estimated that 40% of new journal articles are now open access. But publishers of edited books have been under far less pressure and so they are typically opaque about their embargo periods, making open access versions harder to find. Summing up these substantial barriers Bishop argued: ‘If you write a chapter for an edited book, you might as well write the paper and then bury it in a hole in the ground’. (iv) ‘Books aren’t as available online as journal articles because.. they remain in a packaging shell, with chapters trapped therein. There is no “chapter economy.” This limits [edited] book[s’] metadata and searchability to often the shell components and not the muscle and sinew — aka, the chapters’. Symptomatic of this problem is that book chapters are still not issued DOIs (digital object identifiers), unlike articles. (v) ‘Journals are broadcast on a regular basis, books are not… Journal brands are more predictable, constant, and “in your face”… Regular publication means bigger journal metadata footprints. Books come out sporadically, with a changing cast of characters — topics, editors, authors, titles, subjects’. (vi) ‘New information … contained in most scientific (empirical) articles draws media coverage.., and high interest from the most passionate researchers and practitioners in the field. This magnetic pull also draws these same influential sources of awareness-building into the review articles..’. Chapters in edited books lack these focusing supports. Meanwhile on another front, chapters in books suffered a loss of credibility in official research audit exercises like the UK’s REF and Australia’s ERA. To the rushed academic readers on government grading panels (e.g. claiming to individually rate some 202,000 research outputs for quality in the UK’s 2014 review), chapters in books were just too hard to assess. They smacked of an effort to evade peer review — by authors publishing with their mates instead of going through the rough and tumble of journal submissions. Again this attitude in time spilled over into how (elite) university promotion committees rated outputs. Outside the book-and-chapter loving disciplines (history, English, literature studies and philosophy) ambitious ECRs and PhDs were warned off writing chapters and urged to focus on journal articles alone. The lure of writing chapters in friends’ books still remained strong for older researchers in some mixed disciplines, and for academics approached by keen publishers. A. Writing a chapter for an edited book can be a lot quicker and more predictable than hacking through journal processes. The citing process for a chapter can also get started faster if you can digitally disseminate knowledge of it as soon as it is accepted (Thompson, 2012). B. There is generally then a gap of six or seven months before the final printed version is published in the book. Authors are now generally free to put the manuscript version of their chapters up on scholarly communication sites like ResearchGate and Academia.edu in this period, as well as lodging it permanently on their university repository. It is important to make sure that the full details of the chapter within the edited book and its editors and publishers are prominently given at the top of a chapter PDF. This helps appease publishers and editors with advance publicity gained from tweeting and FBing it out. It also means that readers can correctly reference the final text in a stable way (although they may need to recheck page numbers). C. To generate some traffic for a piece authors can also ask the editors and publisher if theirs can be one of the free sample chapters whose final versions are made freely available so as to help advertise the book. D. Once the book is published, and enters its key sale period, the author of every chapter (including the editors) should each write a blogpost about their own chapter, and if possible get it into a large-audience multi-author blog, just as they should do for every new journal article. Tweeting and FBing the key messages then leads readers to the blogpost, and from there there are URL links both to the print book and to the open access full text. E. For the first year to 18 months authors that the book is on sale (or whatever the embargo period is) authors may then have to temporarily take offline the ResearchGate or Academia versions of their chapter — but of course can keep up their home repository version. However, it is also worth seeing if your editors or publisher really care if you keep these OA versions up — given that your chapter is normally not directly or separately identifiable within any aspect of the book’s publicity. F. Once the embargo clears, authors should reinstate both the easier access OA versions, and then retweet and re-FB the chapter’s wider OA appearance. These six steps can make sure that one or more OA-versions of your chapter are always available, so that it becomes an individually accessible unit in its own right. Yet will publishers or editors not object to this? Sadly, there may be cases where rather ignorant publishers or old-fashioned book editors view these steps as tending to reduce the sales of the book. In fact nothing can be further from the truth. Building up usage of an OA version of chapter can help the edited book that it sits within to build up sales, credibility, recommendations and teaching uses. Especially in the critical initial sales period this encourages libraries to buy the book. The OA availability steps above might just conceivably head off one or two sales of an expensive academic volume to other academics. But they will have far greater efficacy than publishers’ patently inadequate print-era legacy strategies in boosting knowledge and institutional sales of any edited book. The six strategies above also chime in with the growth of ‘long tail’ book retailing plus the advent of hugely better search engines. Both have been good news for the ‘findability’ of chapters in edited books. So too was the launch and rapid ascendency of Google Scholar, which covers book chapters on much the same basis as articles. Where Google Books also allows generous views into the text of edited books, and a capacity to search for key words throughout an edited book (again the publisher’s decision), readers’ access to information about chapters is also far greater now than before. As for the design and writing of chapters, all the advice given in another of my posts on creating better and more interesting journal articles applies here with equal force. Try to write a full narrative title giving the core message of the chapter. If this seems too difficult, at least ensure that your chapter title has strong narrative cues within it to the argument or conclusions. Strictly avoid formal, vacuous or ‘box’ titles that will cause your chapter to get lost in search engines. And remember there are usually no abstracts in edited books, so clear and informative titles are especially important in attracting readers. (In your OA manuscript version it is a great idea to also include a chapter abstract, even though that does not make it into the final published version). Try to achieve a high impact start for a chapter, one that is uncluttered and introduces readers quickly to its structure. With no chapter abstract in the published version, you need an introduction that gives a swift précis of the argument before diving into the main substantive sections. It is vital to stick within the editors’ word limits for chapters, generally 8,000 to 10,000 words, which implies perhaps only four or five main sub-headings. Leave enough space to ‘close out’ your chapter by first recapping on key findings and arguments and then linking outwards to other chapters in the book (assuming that you get sight of them in time). None of this is to deny that if you have strong primary research to report it is better to push it out in journals wherever feasible. But book chapters can have valuable exploratory, discursive, synoptic and review roles. And they can carry new findings too, especially in start-up fields and with good editors and editing. The old problems from the early digital phase, when for a while chapter texts became literally unfindable, and authors passively left things to publishers to promote their work, no longer apply with much of their previous force. However conservative your editors and publishers may be, you can get your chapter noticed, read and cited in the communities that matter to you. You may also find other helpful advice in my book: Patrick Dunleavy, ‘Authoring a PhD’ (Palgrave, 2003) which covers becoming a better author, stylist and self-editor. And my @Write4Research Twitter feed pulls together a wide range of the latest writing advice.